The #1 cause of water loss in your system is a leak in your main water service pipe. Your main water service is typically buried underground, starting at the municipality’s meter up to the entrance of your house. 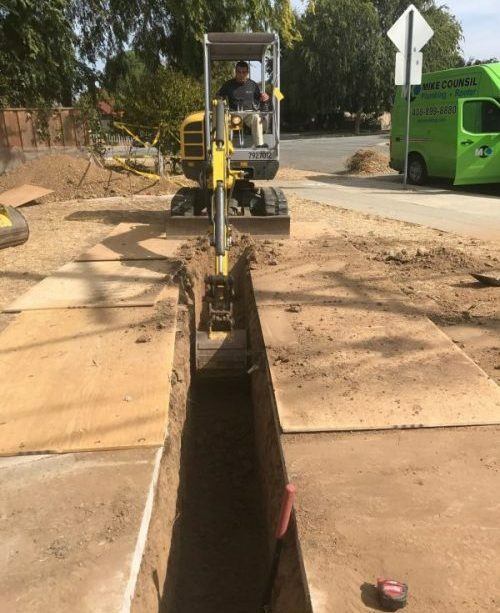 Being underground and outdoors, this service line is put to the test from the earth’s natural elements of moisture, humidity, seismic movement, tree roots and underground rocks and debris. When you combine this with years of continuous pressure and hard water flowing through the pipe, it’s inevitable that a repair or replacement will be necessary at some point. Call Mike Counsil Plumbing water distribution specialists to get your water bill back in line. Wet spots in your yard between the meter box and your house. The sound of running water or a hissing sound coming from your main shut off valve when water is not being used in your home. Water leaking into your basement or crawl space near the location of your water service line. A noticeable loss of water pressure or flow throughout your home. Water bills showing progressively higher water consumption that cannot be explained otherwise.